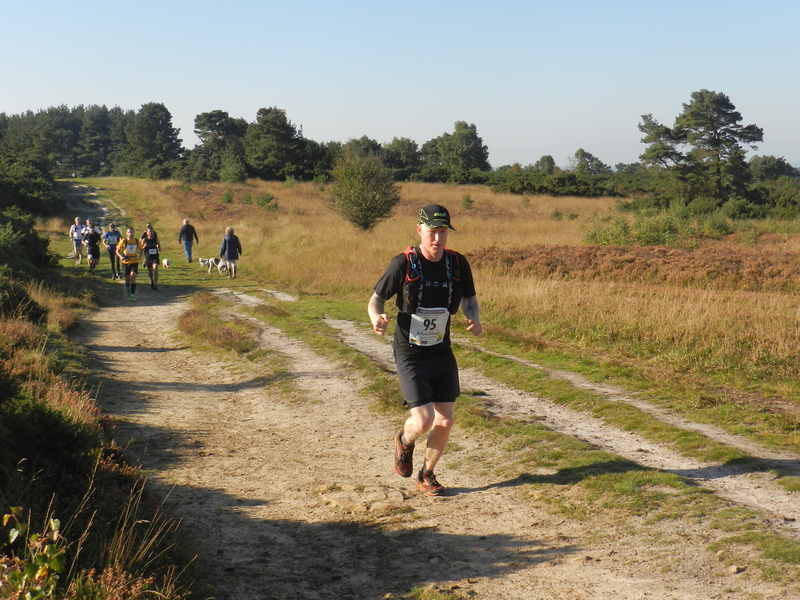 High Weald Challenge 2015 – Having struggled a little with the Purbeck Marathon the week before I was a little pensive heading in to the High Weald Challenge, a 50k Ultra through Ashdown Forest in East Sussex. The hills would certainly not be as difficult but the distance might prove my undoing. It’s interesting looking at my Strava milage over the past few weeks. I had not run a trail race for 5 weeks before Purbeck, but it was my last 50k distance at Salisbury. So by recent standards August was a very lax month. However, I actually did way more total miles in August because I did two very long indoor bike rides. I did a 100 miler which took me around 5 hours and a 500km ride which took 15 hours! I also did a triathlon during those 5 lazy weeks too. 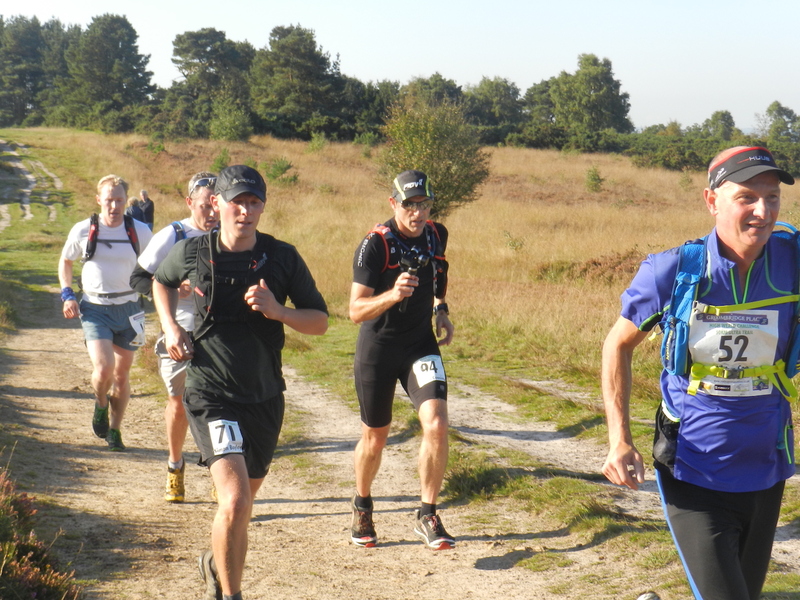 The High Weald Challenge is in its second year and is organised by Stuart Mills from Trail Running Sussex. Richard and I arrived at Groombridge Place good and early in time to see the sun rising over the moat around the building. It looked very beautiful, as did the four huge Redwood trees in front of the house where race registration had been set up. Both Richard and I commented how much it looked as though we were in the States. It was, however, absolutely freezing cold. We registered and were handed a book of instructions! Blimey. It was a booklet with quite detailed navigation. No map, just text telling us where to go. Apparently the course was not fully signposted as the route follows three way marked paths, the Vanguard Way, High Weald Landscape Trail and Weald Way. Any sections not on those paths would be signposted. It was a short walk from the Giant Redwoods and Groombridge Place to the start on the street. By the time we lined up to run, it was already getting warmer. Stuart had written the word ‘Start’, in chalk on the tarmac, so there was no doubt where we were to begin. Although I’m not convinced of his description of it as street art! Stuart’s race briefing consisted of him telling us that he held the course record as – because it’s a different route to the inaugural year – he’s the only person to have run it. However, if his time of 4 hours 12 minutes is correct, that would be some decent time to have to beat. With a blast on the hooter we were away. I had decided I would follow Richard. With hindsight, this was a mistake and one which I really should realise by now is almost always a mistake. The only times I seem to beat Richard are when I start at my own pace and catch him up towards the end. There are exceptions and usually I don’t catch him up at all. Only twice have I beaten Richard by charging off at his pace and both of them were in relatively short races. However, I kept up a decent pace for the first 20km through fields and downland, up to Ashdown Forest and across the top with majestic views stretching out ahead. I was beginning to tire a little when we came to Pooh Bridge in the heart of the forest. It’s the bridge where Winnie the Pooh and Christopher Robin played Pooh Sticks. When I stopped to film briefly, the small group I was with, which included Richard, were off. I couldn’t catch them and from that moment I was done in. At half way I missed the chalk markings on the road and ran the wrong way for a few hundred yards before turning back and standing round aimlessly for a few minutes. Then I remembered the book. Following the typed directions therein I was able to get back on the High Weald Challenge course and I kept it in my hand for the rest of the race. There was a checkpoint at 27km in the village of Forest Row and I was told that the group I had been with were already 5 minutes ahead. Having set quite a fast pace for the first half of the race the second half was a very different story. I was in 25th place with 20km to go but gradually I was being caught by runners and every so often one or two would overtake and be gone in to the distance as quickly as they came. I just couldn’t keep up. I had neck pain and my stomach wasn’t feeling great. I had had one baby food sachet and was drinking coconut water from my backpack and Coke at the aid stations. I can’t really eat on long runs so I wasn’t consuming any of the crips, biscuits, cake, bananas or sweets on offer. Despite this I was enjoying the run. The weather was good, the route was pretty without being stunning in the second half and the excitement of using my new battery operated camera gimbal hasn’t yet worn off. I accepted however, that today was not going to be my fastest 50k and that I was simply going to have to slog out the rest of the High Weald Challenge to the end, which I did. 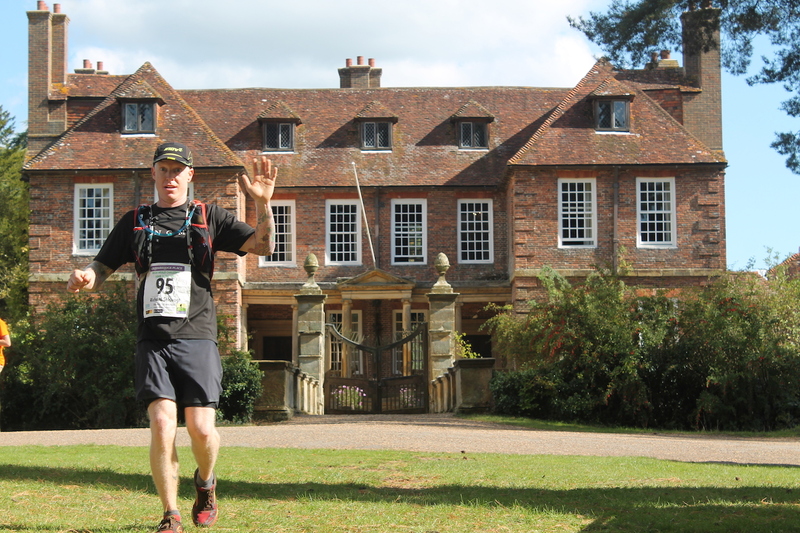 I crossed the line back at Groombridge Place in 38th place in a time of 5 hours 35 minutes. You can see my Strava stats here. 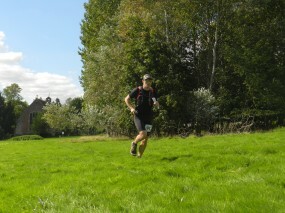 Richard finished 13th in 4 hours 52 minutes, beating his previous best by just a few seconds. I would say that the course isn’t too difficult, it’s just I had a bit of a bad day at the office. 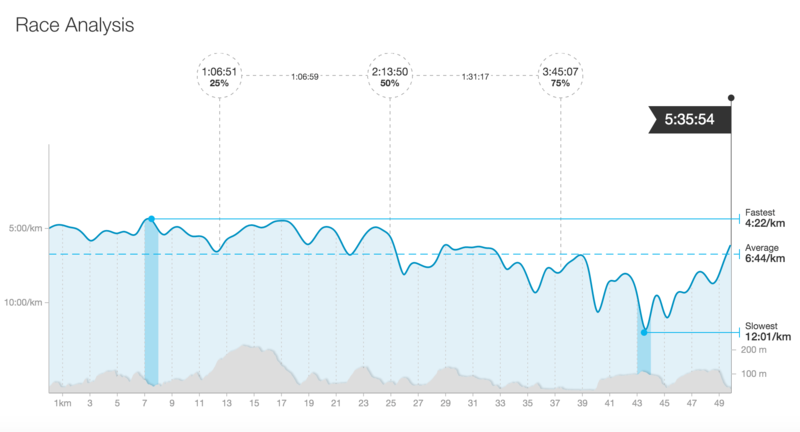 The heat may have played a part and it was certainly more hilly than my PB 50k course at Salisbury, but nothing compared to some of the trail marathons I’ve done. The route is pretty and there are one or two extremely lovely locations, especially running over the top of Ashdown Forest. But there are a few dull bits. It’s certainly one to do if you are looking for a relatively easy 50k. 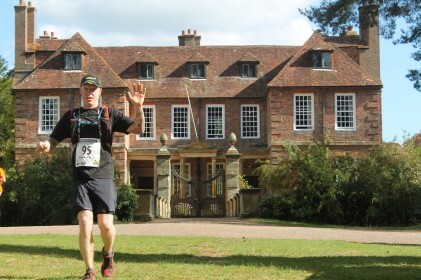 It’s small and friendly, Groombridge is a gorgeous little village and the start finish location at Groombridge Place is certainly one of the most beautiful things about the race. 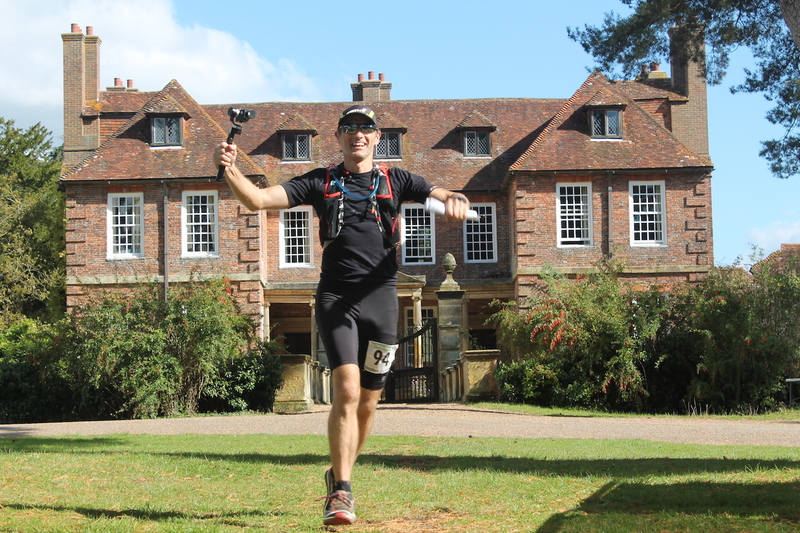 If you have enjoyed this High Weald Challenge race report and video, please share it with your friends and give it a Facebook ‘like’ or a Google +1. See you at the Downs Link Ultra next week! !